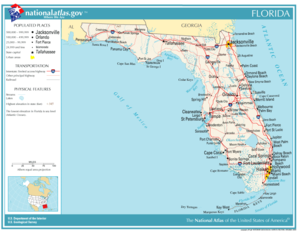 Florida is a state located in the southeastern United States. Most of the state is a large peninsula with the Gulf of Mexico on its west and the Atlantic Ocean on its east. It has a warm and humid subtropical climate. It was named by Juan Ponce de León, who landed on the coast on April 2, 1513, during Pascua Florida (Spanish for "Flowery Easter," referring to the Easter season). Florida's economy relies heavily on tourism. At 345 feet (105 m) above mean sea level, Britton Hill is the highest point in Florida and the lowest highpoint of any U.S. state. Contrary to popular belief, however, Florida is not entirely "flat." Some places, such as Clearwater, feature vistas that rise 50 to 100 feet (15–30 m) above the water. Much of the interior of Florida, typically 25 miles (40 km) or more away from the coastline, features rolling hills with elevations ranging from 100 to 250 feet (30–76 m) in many locations. Lake County holds the highest point of peninsular Florida, Sugarloaf Mountain, at 312 feet (95 m). The state line begins in the Atlantic Ocean, traveling west, south, and north up the thalweg of the Saint Mary's River. At the origin of that river, it then follows a straight line nearly due west and slightly north, to the point where the confluence of the Flint River (from Georgia) and the Chattahoochee River (down the Alabama/Georgia line) used to form Florida's Apalachicola River. (Since Woodruff Dam was built, this point has been under Lake Seminole.) The border with Georgia continues north through the lake for a short distance up the former thalweg of the Chattahoochee, then with Alabama runs due west along latitude 31°N to the Perdido River, then south along its thalweg to the Gulf via Perdido Bay. The climate of Florida is tempered somewhat by its proximity to water. Most of the state has a humid subtropical climate, except for the southern tip which borders on tropical and the Florida Keys which have a true tropical climate. Cold fronts can occasionally bring high winds and cool to cold temperatures to the entire state during late fall and winter. One such front swept through the peninsula on November 25, 1996, bringing cold temperatures and winds up to 95 miles per hour (150 km/h), knocking out power to thousands and damaging mobile homes. The seasons in Florida are actually determined more by precipitation than by temperature with mild to cool, relatively dry winters and autumns (the dry season) and hot, wet springs and summers (the wet season). The Gulf Stream has a moderating effect on the climate, and although much of Florida commonly sees a high summer temperature over 90 degrees Fahrenheit (32 °C), the mercury seldom exceeds 100 degrees Fahrenheit (39 °C). The hottest temperature ever recorded in the state was 109 °F (43 °C), set on June 29, 1931 in Monticello. The coldest was –2°F (−19 °C), on February 13, 1899, just 25 miles (40 km) away, in Tallahassee. Mean high temperatures for late July are primarily in the low 90s Fahrenheit (32–35 °C). Mean low temperatures for late January range from the low 40s Fahrenheit (4–7 °C) in northern Florida to the mid-50s (≈13 °C) in southern Florida. Florida taken from NASA Shuttle Mission STS-95 on October 31, 1998. 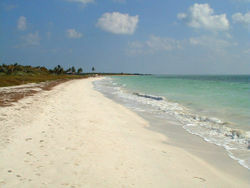 The Florida Keys, being surrounded by water, have a more tropical climate, with lesser variability in temperatures. At Key West, temperatures rarely exceed 90 °F in the summer or fall below 60 °F in the winter, and frost has never been reported in the Keys. Florida's nickname is the "Sunshine State," but severe weather is a common occurrence in the state. Central Florida is known as the lightning capital of the United States, as it experiences more lightning strikes than anywhere else in the country. Florida has the highest average precipitation of any state, in large part because afternoon thunderstorms are common in most of the state from late spring until early autumn. A fair day may be interrupted with a storm, only to return to sunshine. These thunderstorms, caused by collisions between airflow from the Gulf of Mexico and airflow from the Atlantic Ocean, pop up in the early afternoon and can bring heavy downpours, high winds, and sometimes tornadoes. Florida leads the United States in tornadoes per square mile, but these tornadoes do not typically reach the intensity of those in the Midwest and Great Plains. Hail often accompanies the most severe thunderstorms. Snow is a rare occurrence in Florida. During the Great Blizzard of 1899, Florida experienced blizzard conditions. During that time, the Tampa Bay Area had "gulf-effect" snow, similar to lake-effect snow. The Great Blizzard of 1899 is the only time the temperature in the state is known to have fallen below 0 degrees Fahrenheit (−18 °C). The most widespread snowfall in Florida history happened in February 1978, when snow fell over much of the state in different times of the month, as far south as Homestead. Snow flurries fell on Miami Beach for the only time in recorded history. 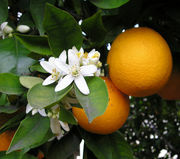 1982's " Cold Sunday," which saw freezing conditions throughout much of the country, ruined that year's orange crops. In 1989, a severe hard freeze created lots of ice and also caused minor flurries in sections of the state and resulted in rolling blackouts from power failures caused by massive demands on the power grid for heating. A hard freeze in 2003 brought "ocean-effect" snow flurries to the Atlantic coast as far south as Cape Canaveral. The 1993 Superstorm brought blizzard conditions to the panhandle, while heavy rain and tornadoes beset the peninsula. The storm is believed to have been similar in composition to a hurricane, and even brought storm surges of six feet or more to regions of the Gulf coast. Although some storms have formed out of season, hurricanes pose a threat during hurricane season, which lasts from June 1 to November 30. Florida saw a slew of destruction in 2004, when it was hit by a record four hurricanes. Hurricanes Charley ( August 13), Frances ( September 4– 5), Ivan ( September 16), and Jeanne ( September 25– 26) cumulatively cost the state's economy US$42 billion. In 2005, Hurricane Dennis ( July 10) became the fifth storm to strike Florida within eleven months. Later, Hurricane Katrina ( August 25) passed through South Florida and Hurricane Rita ( September 20) swept through the Florida Keys. Hurricane Wilma made landfall in Florida in the early morning of October 24 as a Category 3 hurricane, with the storm's eye hitting near Cape Romano, just south of Marco Island, according to the National Hurricane Centre. 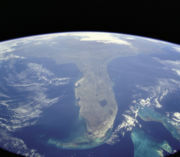 Florida is the fifth-largest producer of greenhouse gases among the 50 U.S. states. This may coincide with the fact that Florida is the fourth most populous state in the United States. Climatologists and scientists debate whether global warming is to blame for an increase in the number of strong hurricanes. Others debate whether global warming actually exists. The scientists Peter Webster and Judith Curry of the Georgia Institute of Technology published research in 2005 showing an increase in global hurricane intensity, with a doubling of the number of Category 4 or 5 hurricanes since 1970. That increase coincides with a rise of nearly 1 degree Fahrenheit in ocean surface temperatures. They argue that there is a connection, while Florida's state climatologist, James O'Brien, argues the increase in stronger storms is merely part of a natural cycle. In fact, scientists have already observed changes in Florida consistent with the early effects of global warming: retreating and eroding shorelines, dying coral reefs, saltwater intrusion into inland freshwater aquifers, an upswing in forest fires, and warmer air and sea-surface temperatures. The greatest threat from global warming is a rise in sea levels. Much of Florida, being only a few feet above sea level now, would be underwater if the sea level rose dramatically due to the continued melting of glaciers, parts of the Antarctic ice shelf, or Greenland's cover of ice. Even a rise of less than a foot could mean "seawater will advance inland as much as 400 feet in low-lying areas, flooding shoreline homes and hotels, limiting future development, and eroding the state's beloved beaches." 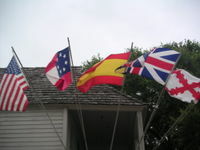 Five of the flags that have been flown over Florida throughout the centuries. Archaeological finds indicate that Florida had been inhabited for thousands of years before any European settlements. Of the many indigenous people, the largest known were the Ais, the Apalachee, the Calusa, the Timucua and the Tocobago tribes. Juan Ponce de León, a Spanish conquistador, named Florida in honour of his discovery of the land on April 2, 1513, during Pascua Florida, a Spanish term for the Easter season. From that date forward, the land became known as "La Florida." (Juan Ponce de León may not have been the first European to reach Florida. At least one Indian that he encountered in Florida in 1513 could speak Spanish.. Alternatively, the Spanish-speaking Indian could have been in contact with areas where Spanish settlements already existed, and Ponce de León was indeed the discoverer). Over the following century, both the Spanish and French established settlements in Florida, with varying degrees of success. In 1559, Spanish Pensacola was established by Don Tristán de Luna y Arellano as the first European settlement in the continental United States, but it had become abandoned by 1561 and would not be reinhabited until the 1690s. French Huguenots founded Fort Caroline in modern-day Jacksonville in 1564, but this fort was conquered by forces from the new Spanish colony of St. Augustine the following year. After Huguenot leader Jean Ribault had learned of the new Spanish threat, he launched an expedition to sack the Spanish settlement; en route, however, severe storms at sea waylaid the expedition, which consisted of most of the colony's men, allowing St. Augustine founder Pedro Menéndez de Avilés time to march his men over land and conquer Fort Caroline. Most of the Huguenots were slaughtered, and Menéndez de Avilés marched south and captured the survivors of the wrecked French fleet, ordering all but a few Catholics executed beside a river subsequently called Matanzas (Spanish for 'killings'). St. Augustine came to serve as the capitals of the British and Spanish colonies of East and West Florida, respectively. The Spanish never had a firm hold on Florida, and maintained tenuous control over the region by converting the local tribes, briefly with Jesuits and later with Franciscan friars. The local leaders ( caciques) demonstrated their loyalty to the Spanish by converting to Roman Catholicism and welcoming the Franciscan priests into their villages. 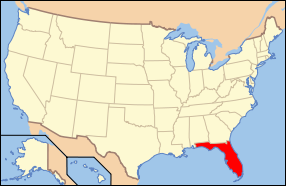 The area of Spanish Florida diminished with the establishment of English colonies to the north and French colonies to the west. The English weakened Spanish power in the area by supplying their Creek Indian allies with firearms and urging them to raid the Timucuan and Apalachee client-tribes of the Spanish. The English attacked St. Augustine, burning the city and its cathedral to the ground several times, while the citizens hid behind the walls of the Castillo de San Marcos. The Spanish, meanwhile, encouraged slaves to flee the English-held Carolinas and come to Florida, where they were converted to Roman Catholicism and given freedom. They settled in a buffer community north of St. Augustine, called Gracie Real de Santa Teresa de Mose, the first completely black settlement in what would become the United States. Great Britain gained control of Florida diplomatically in 1763 through the Peace of Paris (the Castillo de San Marcos surrendered for the first time, having never been taken militarily). Britain tried to develop Florida through the importation of immigrants for labor, including some from Minorca and Greece, but this project ultimately failed. Spain regained Florida after Britain's defeat by the American colonies and the subsequent Treaty of Versailles (1783). Finally, in 1819, by terms of the Adams-Onís Treaty, Spain ceded Florida to the United States in exchange for the American renunciation of any claims on Texas. On March 3, 1845, Florida became the 27th state of the United States of America. On January 10, 1861, before the formal outbreak of the Civil War, Florida seceded from the Union; ten days later, the state became a founding member of the Confederate States of America. The war ended in 1865. On June 25, 1868, Florida's congressional representation was restored. Until the mid-twentieth century, Florida was the least populous Southern state; however, the local climate, tempered by the growing availability of air conditioning, made the state a haven, and migration from the Rust Belt and the Northeast sharply increased the population. Economic prosperity combined with Florida's sudden elevation in profile led to the Florida land boom of the 1920s, which brought a brief period of intense land development before the Great Depression brought it all to a halt. Florida's economy would not fully recover until World War II. Today, Florida is the most populous state in the South besides Texas, and the fourth most populous in the United States. 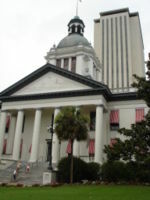 The Florida Legislature is comprised of the Florida Senate, which has 40 members, and the Florida House of Representatives, which has 120 members. The current Governor of Florida] is Republican Jeb Bush, brother of U.S. President George W. Bush and son of former U.S. President George H. W. Bush. The Florida Supreme Court consists of a Chief Justice and six Justices. Florida was traditionally a Democratic Party state; at one time, 68.5 percent of all Floridians were registered Democrats. In the last decades of the twentieth century, the realignment of the " Solid South" has led many conservative Democrats of Florida to vote with the Republican Party. This tendency, combined with explosive population growth, which has brought many Republicans into the state, has given Florida a Republican edge in practice. As a result, Republicans control the governorship and most other statewide elective offices: both houses of the state legislature, 18 of the state's 25 seats in the House of Representatives, and one of the state's two Senate seats. The disputed 2000 Presidential election in Florida was extremely close. Because of the state's population and number of electoral votes, political analysts consider it to be a key swing state in presidential elections. The Tampa area, once a major centre of Democratic union support, is now almost evenly split between registered Republicans and Democrats, making it part of the important I-4 Corridor swing region. 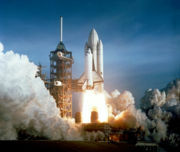 Launch of Space Shuttle Columbia from Kennedy Space Centre. The gross state product of Florida in 2005 was $596 billion . Personal income was $30,098 per capita, ranking 26th in the nation. Florida's economy relies heavily on tourism. About 60 million visitors visit the state every year. Warm weather and hundreds of miles of beach attract vacationers from around the world. The Walt Disney World Resort, a mega-resort consisting of four theme parks, more than twenty hotels, water parks, shopping centers, and other attractions, is an important tourist attraction located in Lake Buena Vista. Together, Walt Disney World, and other theme park resorts such as Universal Orlando Resort and SeaWorld, are an important driver of the Central Florida economy. Other major industries include citrus fruit and juice production, banking, and phosphate mining within the Bone Valley region. With the arrival of the space program at Kennedy Space Centre in the 1960s, Florida has developed a sizeable aerospace industry. The state did not have a state minimum wage law until November 2, 2004, when voters passed a constitutional amendment establishing a state minimum wage and mandating that it be adjusted for inflation every six months. Historically, Florida's economy was based upon cattle farming and agriculture (especially sugarcane, citrus, tomatoes, and strawberries). In the early 1900, land speculators discovered Florida, and Plant and Henry Flagler developed railway systems, which led people to move in, drawn by the weather and local economies. From then on, tourism boomed, fueling a cycle of development and tourism that overwhelmed a great deal of farmland. Florida is one of the nine states that do not impose a personal income tax ( list of others). The state imposes a tax on "intangible personal property" (stocks, bonds, mutual funds, money market funds, etc. ), but this tax will be abolished in 2007. The state sales tax rate is 6% . Local governments may levy an additional local option sales tax of up to 1.5%. A locale's use-tax rate is the same as its sales-tax rate, including local options, if any. Use taxes are payable for purchases made out of state and brought into Florida within six months of the purchase date. Other taxes are mostly levied on businesses. They include the following taxes: corporate income, communication services, intangibles, unemployment, solid waste, documentary stamps, insurance premium, pollutants, and various fuel taxes. For more information, visit the Florida Department of Revenue website at . The centre of population of Florida is located in Polk County, in the town of Lake Wales . Whites of all ethnicities are present in all areas of the state. Those of British ancestry are present in large numbers in the coastal cities. 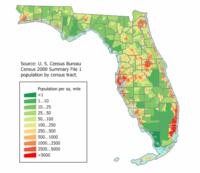 There is a large German population in Southwest Florida, a sizeable and historic Italian community in the Miami area, and white Floridians of longer-present generations in the culturally southern areas of inland and northern Florida. Native white Floridians, especially those who have descended from long-time Florida families, affectionately referred to themselves as " Florida Crackers." As of 2000, 76.9 percent of Florida residents age 5 and older speak only English at home, while 16.5 percent speak Spanish. Haitian Creole is the third most spoken language at 2.2 percent, followed by German at 0.6 percent and Italian at 0.4 percent. 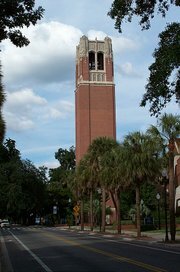 Century Tower, University of Florida. Florida public schools have consistently ranked in the bottom 25 percent of many national surveys and average test-score rankings. Many education surveys are not scientific, but measure prestige. Governor Jeb Bush has been criticized by many Florida educators for a program that penalizes underperforming schools (as indicated by standardized tests, most prominently the FCAT) with fewer funding dollars. Supporters say the program's tough measures have resulted in vast improvements to the education system. Major testing organizations frequently discount the use of state's average test-score rankings, or any average of scaled scores, as a valid metric (for details on scaled test scores, see psychometrics). In 2000, the governor and the state legislature abolished the Florida Board of Regents, which long had governed the State University System of Florida, and created boards of trustees to govern each university. As is typical of executive-appointed government boards, the appointees so far have overwhelmingly belonged to the governor's party. This effect has not been without controversy. In 2002, former governor and then U.S. Senator Bob Graham ( Dem.) led a constitutional-amendment ballot referendum designed to restore the board-of-regents system. Voters responded by creating the Florida Board of Governors; however, each university still maintains a Board of Trustees which work under this new, overseeing Board of Governors. I-75, which enters the state near Lake City (45 miles west of Jacksonville) and continues southward through Gainesville, Ocala, Tampa's eastern suburbs, Bradenton, Sarasota, and Fort Myers to Naples, where it crosses the "Alligator Alley" as a toll road to Fort Lauderdale before turning southward and terminating in Hialeah/ Miami Lakes having junctions with I-10 at Lake City and I-4 at Tampa. I-195, an extension of Miami's Airport Expressway ( S.R. 112); a spur eastward from I-95 to Miami Beach. I-275, a sixty-mile (100 km) westward loop from I-75 north of Ellenton, over the Sunshine Skyway Bridge, through St. Petersburg, to Tampa International Airport and downtown Tampa, reconnecting with I-75 in Tampa's northern suburbs. I-395, an extension of Miami's Dolphin Expressway ( S.R. 836); a spur eastward from I-95 to Miami Beach. In 2000, voters approved a constitutional amendment to construct a high-speed rail system to interconnect Florida's major cities. A committee was formed by the Florida Legislature to oversee the project; however, in 2004, Governor Jeb Bush and other lawmakers pushed for an amendment to remove the amendment, which succeeded. They stated that the cost would have been too high to construct the system, but proponents of the system said the claims regarding high cost were exaggerated and taken out of context, compared with the cost of building roads, maintaining automobiles, and so forth. The Florida High Speed Rail Authority, originally formed to implement the high-speed-rail amendment, has vowed to find a way to implement the system without the amendment. Amtrak service exists in Florida: Sanford, in Greater Orlando, is the southern terminus of the Amtrak Auto Train, which originates at Lorton, Virginia, south of Washington, DC. Orlando is also the eastern terminus of the Sunset Limited, which travels across the southern United States via New Orleans, Houston, and San Antonio to its western terminus of Los Angeles. Florida is served by two additional Amtrak trains (the Silver Star and the Silver Meteor), which operate between New York City and Miami. Public transportation systems exist in many major cities. Miami has an automated guideway people-mover system, as well as a 22-mile metro system, and most cities have bus service. In the South Florida Metropolitan area, train service is provided by Tri-Rail; this service has a southern terminus in Miami and a northern terminus in West Palm Beach. It has been proposed that the northern terminus be extended north as far as Stuart in Martin County, but no progress has been made. Tri-Rail provides local bus service from its stations. Greyhound provides commercial bus service between different cities in Florida. Other smaller, regional airports with commercial service (with passengers served in 2005, where available) include those at Daytona Beach (615,841), Fort Walton Beach, Gainesville (345,788), Key West, Melbourne (466,367) , Naples, Panama City (382,551), Pensacola (1,638,605), Sarasota-Bradenton (1,337,571), St. Petersburg-Clearwater (596,510) and Tallahassee (1,129,947). Sanford (1,649,237) is primarily served by international charter airlines. Florida has nineteen Metropolitan Statistical Areas (MSAs) defined by the United States Office of Management and Budget (OMB). 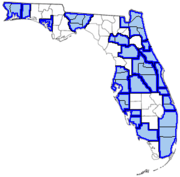 Thirty-eight of Florida's sixty-seven counties are in an MSA. Reflecting the distribution of population in Florida, Metropolitan areas in the state are concentrated around the coast of the peninsula. They form a continuous band on the east coast of Florida, stretching from the Jacksonville MSA to the Miami-Fort Lauderdale-West Palm Beach MSA, including nearly every county on the east coast, with the exceptions of Flagler County and Monroe County. There is also a continuous band of MSAs on the west coast of the peninsula from the Tampa-St. Petersburg-Clearwater MSA to the Naples-Marco Island MSA, including all of the coastal counties from Hernando County to Collier County. The interior of the northern half of the peninsula also has several MSAs, connecting the east and west coast MSAs. A few MSAs are scattered across the Florida panhandle. Although Florida is the traditional home to Major League Baseball's spring training, and nearly 2/3 of all MLB teams still have a spring training presence in the state, Florida did not have a permanent major-league-level professional sports team until the American Football League added the Miami Dolphins in 1966. The state now has three NFL teams, two MLB teams, two NBA teams, and two NHL teams. With two of its most historically-important teams, Florida is one of the most important markets for the Arena Football League. Florida also hosts a variety of minor league baseball, football, basketball, ice hockey, soccer and indoor football teams. Florida is host to many types of animals. Birds : Bald Eagle, Caracca, Everglades Kite, Osprey, Pelicans, Sea Gulls, Whooping & Sandhill Cranes, Roseate Spoonbill, Florida Scrub Jay (State endemic), and many more. Note : Florida is a winter home for most of eastern North America's birds.